Nathaniel and Nicholas share a bedroom and a queen-size bed. Nicholas has long seemed to consider it his personal mission to annoy Nathaniel to the point of distraction while he's reading or trying to go to sleep. So lately, Nathaniel has started retreating to their closet to read at night. He just takes his pillow in there and reads until he's sleepy, then goes to bed. A few nights ago, he got so sleepy he just keeled over and sacked out right there in the closet. 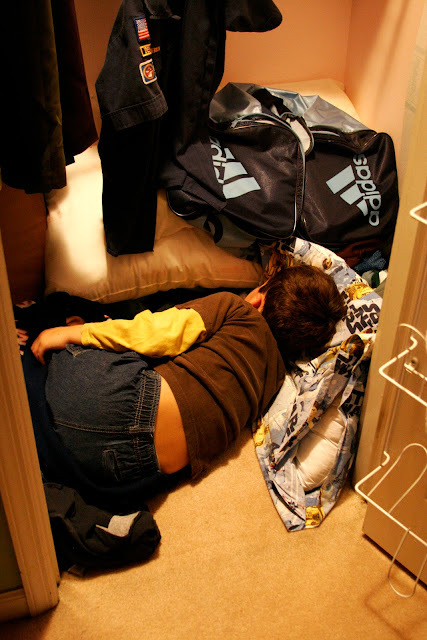 He was bunched up like a roly poly in there, because the closet is barely wider than he is. When we discovered him in there about 10:30, I woke him up to see if he wanted to move to the bed. The answer was "Yes." I don't think he opened his eyes between the closet and the bed, though. Reminds me of the time when I was his age and my dad heard me get up to use the bathroom around 10 or 11:00 at night. He thought it sounded a little strange, though, and when he walked in to check on me, I was sitting on the trash can with my eyes closed, peeing. You are so very welcome for that mental image. I used to read in my closet too! What a perfect little spot for him, even if he does fall asleep. And last night I got a 6 minute video of my husband sleep walking, and I had to stop him from peeing in our closet! Priceless, I tell ya! That's hilarious. Reminds me of the time I woke up in the middle of the night to go to the bathroom and got disoriented and ended up in my mom's closet. I never read in my closet, but I certainly read under my covers with a flashlight for years! With the new baby on the way, Nathaniel may be getting his own room, after all. We'll see!